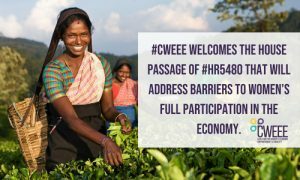 WASHINGTON (July 17)—The International Center for Research on Women (ICRW) welcomes the House passage of the Women’s Entrepreneurship and Economic Empowerment (WEEE) Act of 2018 (HR.5480), a bipartisan bill that prioritizes women’s economic empowerment and highlights financial tools, resources, and rights necessary for women to advance. “At a time when bipartisanship seems so elusive, it is extremely gratifying to know that there is such broad support for women’s economic empowerment,” said Lyric Thompson, ICRW’s director of policy and advocacy. The legislation will bolster U.S. Agency for International Development (USAID) programs and activities focused on women’s entrepreneurship and economic empowerment globally. By highlighting critical barriers to women’s economic empowerment, the bill creates government policy to support women as they start and grow businesses, expand their earnings and savings and bring greater prosperity to themselves, their families and their communities. The bill strengthens USAID’s efforts to improve women’s access to and control of resources such as property and land, while recognizing the critical need to address key structural issues such as discriminatory legal frameworks and norms. The bill also increases opportunity for women by expanding USAID’s inclusion of small and medium businesses in development assistance, emphasizing those owned and led by women. This will benefit both the women business owners themselves, as well as the women they employ. Finally, the bill increases USAID’s gender equality efforts by ensuring that gender-specific considerations are integrated into all programs. ICRW is a founding member and co-chair of the Coalition for Women’s Economic Empowerment and Equality, an advocacy coalition of nearly 20 diverse organizations that seek to advance women’s economic empowerment and equality as a foreign policy priority of the U.S. government and multilateral development institutions. The coalition anticipates that the bill will be introduced in the Senate later in the week and is optimistic for similar bipartisan support and swift passage. The International Center for Research on Women is a global research institution whose work advances gender equity, inclusion and the alleviation of poverty worldwide. Headquartered in Washington, DC, with regional offices in India and Uganda, ICRW provides research and analysis to inform programs and policies that promote gender equality and help alleviate poverty.